Over the past few months I've walked miles, delivered thousands of leaflets to thousands of homes, stood out in the rain and the sunshine talking to passers by, handed out leaflets and discovered parts of my town I didn't even know existed. All to try and give people the facts they need to make the right decision in tomorrow's EU referendum. Twenty years ago I was on the other side - a Labour voter who supported the EU, supported mass immigration and thought the UK should join the €uro. A healthy dose of real life helped me to see sense and I've been firmly in the leave camp for a long time. We are the world's 5th largest economy, the EU's largest export market, the world's 5th strongest military power, one of five permanent members of the UN Security Council and the centre of world finance. We may be small in size but we are a global economy, military and trading power. Don't be fooled by snake oil salesmen telling you that we can reform the EU from within, it is unreformable. Don't listen to the wormtongues telling you that we're not good enough to make it on our own. 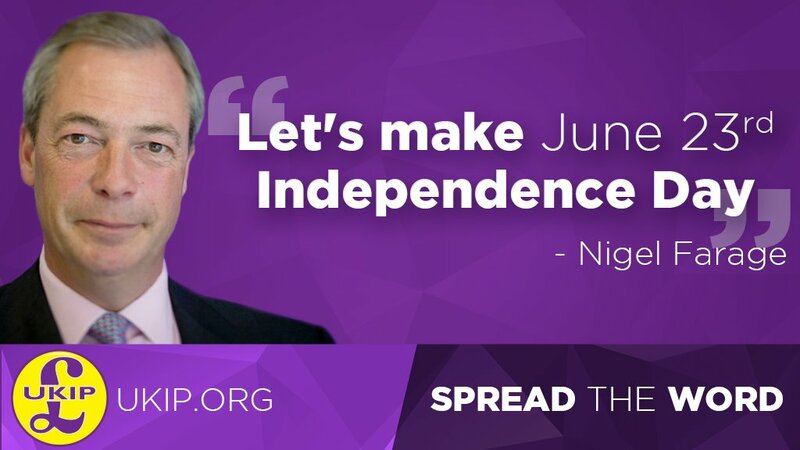 This is our one and only chance to get out of the EU and regain our freedom. I urge you to take this once in a lifetime opportunity and vote Leave and make 23rd June our independence day.